title: Shelters of Faith: The Council of the Church in the Writings of Marsilius of Padua and William of Ockham. Sofia: Sofia University Press, 2010, 280 pp. Shelters of Faith is the product of an almost ten-year-long interest that began while Martin Ossikovski was still a student and which gradually evolved into an in-depth study of the problems in question. 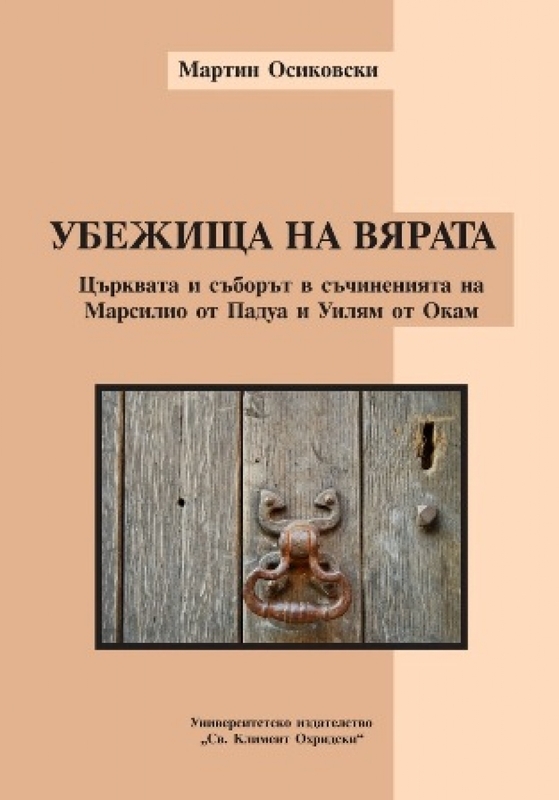 I find the choice of subject of the book to be fully justified and enriching the philosophical, cultural and political studies of the Middle Ages, which in recent years have been developing in Bulgaria too. Contemporary historiography regards the outcome of the conflict between Pope Boniface VIII and King Philip IV the Fair of France as the end of a purely mediaeval political debate. Marsilius of Padua (1280-1342) – a physician, theologian, philosopher, but above all a man of action and long-standing ally of Emperor Louis IV of Bavaria in his struggle against the pope – is traditionally considered to be the first ‘modern’ thinker primarily because of his doctrine of the political organization of society. In fact, Marsilius’ modernity lies elsewhere. Not only did he reject the papal claim to plenitudo potestatis and the exercise of secular power, but he also was the first to critically examine the legitimacy and need of a universal leader of Christianity along the path to salvation. This fundamental assumption, which set the horizon of mediaeval social and political thought, had never before been called into question, not even in the most ferocious struggles between imperial and papal authority. Martin Ossikovski’s book sets out to reveal this turn brought about by the thought of Marsilius of Padua, who overturned the theological-political tradition inherited from St Augustine and, together with the nominalistic nouvelle vague, led to the turbulent waters of the Reformation and modern political thought. I want to note the in-depth investigation and profound knowledge of the relevant sources and contemporary critical literature on which Martin Ossikovski’s study is based. The bibliography lists all source texts on the subject, their modern editions in different European languages, and contemporary critical literature in German, English, French, and Italian. The review of all this literature is not just eruditely impartial and comprehensive; it is always critical, and the author successfully reveals and questions the construction of the different disciplinary fields in which mediaeval political philosophy is interpreted today. I must also note that Martin Ossikovski has set out to study difficult and little known authors from the early fourteenth century, whose works demand lots of time and effort in order to be understood – and that he has coped brilliantly with this task, as evidenced by the excellent translation and profound commentary on the source texts in the book. Especially valuable is the fact that Ossikovski does not limit the subject solely to the authors and theories examined in the book. He uses the views of the relevant philosophers, theologians and ecclesiastical figures as a point of departure for his own theoretical investigations in which he is guided above all by the specificity of the subject of research. It is more than obvious that Ossikovski defends and applies an original historical hermeneutics, which he has successfully begun to develop in order to demonstrate that he is not simply capable of understanding and critically assessing every expounded position – he uses the latter as a starting point both to elucidate the political stakes and to reveal the ecclesiastical and social significance of the respective position, and to carefully and cautiously reflect upon and discuss the process of constitution of pre-modern political science and the different strategies for its legitimation. I find that to be one of the book’s main merits. In fact, Martin Ossikovski has come to be recognized in recent years as one of the leading experts on mediaeval political philosophy in Bulgaria. In his study, he presents the whole circle of problems and stakes of the ecclesiological dispute in the Late Middle Ages in a way that is surprisingly comprehensive, considering the enormity of the task. This is the first such comprehensive study on late mediaeval political philosophy by a Bulgarian author. His work allows one not only to trace the development of the dispute in detail but also to address, with methodological strictness, the question of its political, philosophical and religious significance. Martin Ossikovski has written his book with very strong commitment to the problem field of his scientific interests and, at the same time, he has succeeded in inscribing this personal commitment within an infinitely patient and disciplined meticulousness in investigating the deeply hidden roots of modern political thought. Based on a meticulous enquiry into all aspects of the problem of the general council of the Church and a critical analysis of the institutional and disciplinary practices created by the council, Martin Ossikovski reveals the theological, philosophical and, above all, political dimensions of this complex ecclesiastical and social question, while paying special attention to the places, roles, meanings and values of political science in the culture of the Late Middle Ages. The subject of the book is introduced via two ecclesiastical and political conflicts that were crucial in the early fourteenth century: the fierce dispute on evangelical poverty and ‘the last struggle between the empire and the papacy, that of Pope John ХХII and Louis IV of Bavaria (hence the title of Chapter 1: ‘On the Road to Bavaria’). The investigation of those conflicts allows the author to differentiate his research field and to show the crucial role those fierce conflicts played in the formation of the positions of Marsilius of Padua and especially of William of Ockham, who are at the centre of Ossikovski’s research interest. Generally, it is not enough to say that the author has good knowledge of the history of the ecclesiopolitical debate in the early fourteenth century. He has systematically mastered late mediaeval political thought and reveals, with great erudition, the different contexts that made it possible. Ossikovski has penetrated to the heart of the possibilities and challenges which the institutional framework of the Church presented to political thought. To reveal, for example, the crucial importance of the debates on ‘evangelical poverty’ and on ‘the infallibility of ecclesiastical authority’ (and on precisely who expresses the latter – the council or the pope) as they are expounded by Marsilius of Padua and William of Ockham, Ossikovski examines canon law and scholasticism and, at the same time, traces the powerful impact of the complex and contradictory processes of the concrete historical construction of the radical political programmes of the two thinkers. A task that leads Ossikovski to a detailed investigation and careful enquiry into the still insufficiently explored complex life- and intellectual trajectories of Marsilius of Padua and William of Ockham, which allows him to reveal the new forms of political thinking and action that gradually emerged along with the processes of decline of the papal institution, consolidation of secular power, and the first critical waves that would eventually lead to the end of the mediaeval res publica Christiana. Shelters of Faith, just as every innovative study that is based on an original methodology, raises questions and a desire for further elucidation and debate. I ask myself: isn’t the problem of the general council related far more to the construction of the new model of monastic communities and conciliarism introduced by the ecclesiastical ‘revolution’ of the Franciscan Order in the thirteenth century than to the debates over evangelical poverty? Doesn’t this problem direct us also to the model of community and council as they are defined by St Augustine and, generally, to ‘political Augustinianism’, that major source of mediaeval political thought the break with which would make Marsilius ‘the worst of all heretics’ for a number of popes, canonists and theologians, but that would also ensure his place as a pioneer of modern political thought? But even if we were to remain in the sphere of Thomism, through the prism of which Ossikovski examines the debate for the most part, it ought to be pointed out more clearly that here, too, the basic principle ensuring that Christian society is a single whole is ordinatio ad unum (subordination of plurality to unity), the principle of unity embodied precisely by the bishop of Rome. The study does not pay sufficient attention to the role of the extensive conciliar practice of the thirteenth century – the starting point from which Marsilius of Padua and William of Padua developed their reformist programmes. Nor is enough attention paid to the papal ‘coup’ conducted by Boniface VIII, which both Marsilius and William were actually opposing. But even if we are to remain at John XXII, one cannot but ask about the connection of his strange eschatology (in the history of the Catholic Church there is no other pope whose ideas have been found to be heretical) with his ecclesiology and, hence, with the problem of the council. Left without further consideration – although the book starts with it – is the question of the other counterpoint to papal authority: namely, the monarchy and, generally, secular power and its examination by Marsilius and William and, moreover, primarily in connection with the problem of representation in the conditions of crisis and desacralisation of ecclesiastical authority. Especially active in this respect was Marsilius of Padua, whose main axis of argumentation is the law-monarch-peace line, the true pars construens of his theory – to a much greater extent than the emphasis on conciliarism, which I find to be more of a polemic move against the plenitudo potestatis of the papal institution, against which both thinkers were standing. I think that the consequences of the debate could also have been studied in greater detail and depth: is it possible at all to speak of anticipation of some ‘democratic’ model in pre-modern society, what was its particular influence on pre-modern political philosophy and theology, what was its impact on the further crisis and final split of the res publica Christiana? Finally, while examining conciliarism, one ought – in order for the problem of the council to acquire its precise framework and full context – to take into account also the religious concept of the Christian community which, as such, is above all liturgical and sacramental. This is something that no ecclesiology can ignore, for it is in the liturgy that the communion with the Heavenly Church and community is realized and, being a divine act in the present, the liturgy not only expresses the eschatological reality but also reorders the worldly order, ‘the being together’ of politics as an anticipation of the revealed truth. In fact, these notes are not a reproach against the author; they are merely evidence of the significant questions he raises, of the great critical and heuristic potential of this innovative study and, above all, they are an expression of my expectation of its fruitful continuation.